From instant communication to access to information, the Internet has given us many things. It has also given me a pretty stellar group of wine friends like FLX's own @wino_dino_, Adrian Joaquin Prieto. He is basically the Finger Lakes' CEO—Chief Enthusiasm Officer, that is. And yes, you've seen him around these parts before. So when I was considering an FLX wine for my August wine of the month, I had to message him for his approval first. After his quick thumbs-up (literally "I went there Saturday"), this month I'm sharing the coolest thing to come out of Upstate New York since Wegmans. Let's be Insta friends, too: @megandmerlot. "Old World Winemaking in the Finger Lakes"
Remember my New Year's resolution? Oh, some (all) of you forgot? So weird... As a reminder, my resolution for this year has been to drink more "New World" wines. That is, wine from countries that imported their grapes and techniques during and after the age of exploration. I made this resolution because I love Old World wines and would drink only those if left to my own devices. What I've learned this year is that a lot of "New World" producers care a lot about "Old World" tradition. One such winery is only about five hours driving distance from me: Bloomer Creek Vineyard on Seneca Lake in New York. According to their website, "Old World wine suggests a flavor profile that is leaner, with more subtlety and nuance than rich, concentrated wines produced in the warm-climates of the New World. ... Viticulturally, the cool climate of the Finger Lakes should produce an Old World style of wine. Because we are committed to crafting wine as an unadulterated reflection of a place and time, Bloomer Creek follows the more traditional cellar practices found in the Old World." They specifically focus on Austria and Germany, which also comes across in their varietal selection. My German is limited to the few words I learned for Oktoberfest in Munich in 2015 (Prost!) 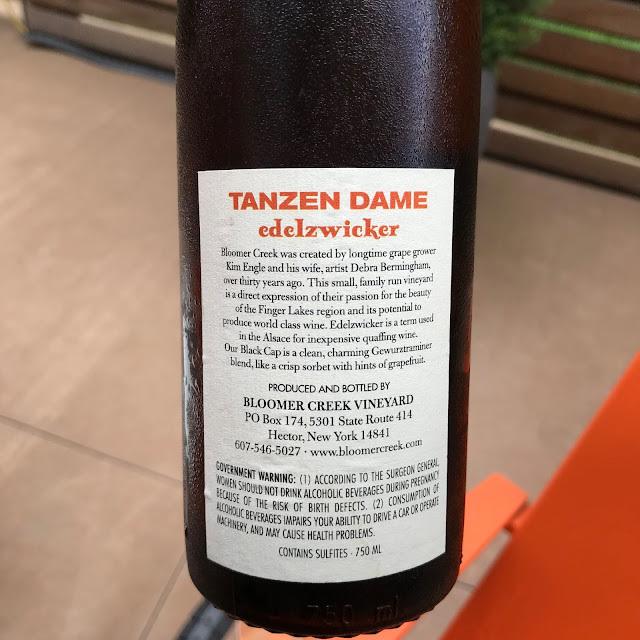 so if Bloomer Creek says "Tanzen Dame" translates to "Dance, Lady?" I believe it. 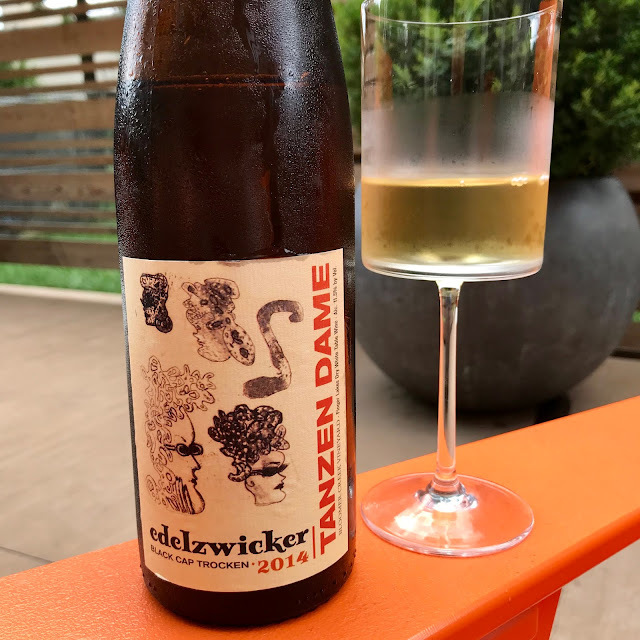 Made of Gewürztraminer, Grüner Veltliner, and Riesling, the Tanzen Dame Edelzwicker Black Cap Trocken 2014 bottling is an aromatic white inspired by Austria. By the way, I also know what the German word "trocken" means: dry. Perfect for you "I don't drink sweet wine" people. While this is fruity and perfumed, don't mistake those notes for sugar. Nose: Clean, pronounced, flavors of peaches, pears, brûléed grapefruit, passionfruit, lemon cream, honeysuckle, honeycomb, ginger, apple blossom, white smoke, matchstick. Palate: Dry, medium+ acid, full body, flavors of passionfruit, grapefruit pith, lemon yogurt, baked peaches, ginger, ash, white pepper, apple blossom, darker smoke. Quality: Very good. This wine has acidity, balance, longevity, and layers of flavor characteristics. Price: Purchased for $15.97 from Astor Wines. I recommend it for aperitif or on a cool summer night. I can imagine sipping this around a crackling fire in the Poconos as the lightning bugs pop in and out. It is refreshing enough for summer but comfy enough for a hoodie and a light breeze. Perfect for August. Check out the 2018 "Wine of the Month" series.